I had a wild plan and approached Dr. Hilary Clayton of Michigan State University's McPhail Center for Equine Performance with my proposal: a camp for professional at her research center, where we could learn about high-tech gait analysis and help her with a research project. With her usual British chipper nonchalance, she replied. "Ok, come in October then. It's already in the works." The Equinology group had a course planned at the McPhail Center and it was to be open to equine professionals in search of a deeper exposure to the high-tech side of equine biomechanics. The McPhail Center, located at the College of Veterinary Medicine at Michigan State University in East Lansing, is one of the few university labs designed expressly for studying equine biomechanics. It is a fantastic facility — our classroom looked into the covered riding arena where research staff and students collect data with the horses. When Dr. Clayton dramatically lifted the curtains on the riding arena the first day, a collective gasp of awe went up from the group. She told us that the building's vaulted ceiling design actually is borrowed from church architecture, so we really were having a religious experience, of sorts! 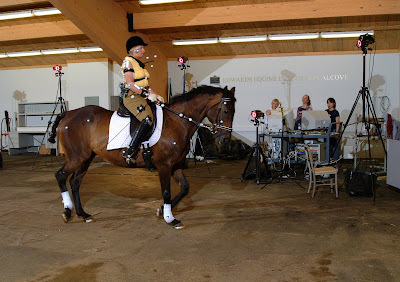 But perhaps that explains the sense of “entering the inner sanctum” that one gets from learning from this world-renowned equine biomechanics expert and her staff and students in the lab designed just for their research. Of course, what is really interesting about the arena is primarily along one side, where eight infrared video cameras collect data from horses lit like Christmas trees (Dr. Clayton’s words), as their anatomical markers move through the cameras’ shimmering red field of vision. It is one thing to hear Dr. Clayton describe the process of research and data collection, and another to experience it for yourself. Dr. Narelle Stubbs, the equine physiotherapist who co-wrote Activate Your Horse’s Core with Dr. Clayton and lab manager LeeAnn Kaiser helped us to tape all the markers on the horse in the right spots. 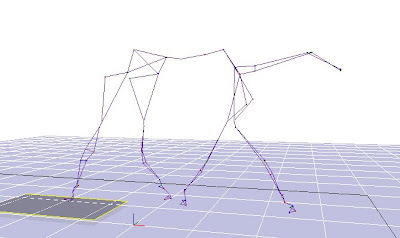 LeeAnn showed us how they calibrate the cameras, create a template, collect the data, connect the dots, and generate three-dimensional computer animation of the horse in motion. The data is also logged into spreadsheets and analyzed for the results of any given project. Dr. Clayton explained that this technology is very similar to how they created “Golem” in Lord of the Rings. A lecture by Dr. Clayton on the function of the stifle offered her untested hypothesis (stemming from the fact that the torque on the stifle joint is in the back of the joint) that the horse’s hamstring muscles are more important in the action of the stifle than the quads. Her thinking on this was that dressage horses are asked to work as though they are “sitting.” A student with experience in ballet volunteered the ballerina's plie support system of standing on the toes while engaging the hamstrings and adductors so that the quads are more relaxed and not the sole source of support. He even demonstrated the plie for the class! Other highlights of the course included how the force plates work, and a riding demonstration of an electronic pad placed beneath the saddle to measure the pressure it puts on the horse’s back as he performs different activities, and an afternoon spent practicing core mobilization and strengthening exercises for horses with Dr. Stubbs. The winter edition of this Equinology course is held at Writtle College in England in January and is sold out. 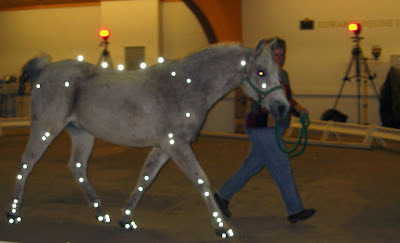 Equinology’s next USA course, Biomechanics and Gait Analysis (EQ300MSU), with Dr. Clayton at The McPhail Center will be held October 12-15, 2009. An understanding of basic anatomic and veterinary vocabulary is a prerequisite for this class. Visit www.equinology.com for more information.